We hope that by getting your feet wet in the boat this weekend, got a little taste of what skiff sailing has to offer, and you’re as stoked as we were! From 29ers to Olympic class 49ers and beyond, we think that skiff sailing is one of the best parts of our sport and we’re glad we got to share some of our passion with you. No matter what your sailing goals are, not much else prepares you for elite level performance like starting right here in Southern California with the Skiff Squad, so we hope to see you again soon! 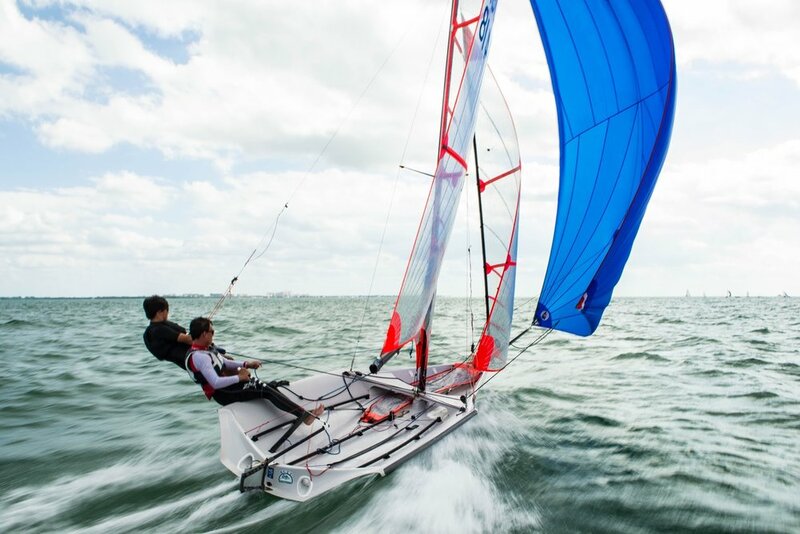 Whether you’re aging or sizing out of the opti, looking to branch out from the CFJ, or looking to apply your trapeze experience from the 420 to an Olympic pathway boat, the 29er can be a great next step for sailors of all shapes and sizes. With competitive sizes for sailors between 75lbs and 190lbs, the 29er offers a fun platform and a super competitive fleet, while offering an inclusive, supportive community vibe that is unique among junior sailing classes in the United States. With the unstable platform, the tapered rig, and the tactical complexity of a planning, asymmetric boat you’ll have a blast ripping around while developing skills to compete with the best in the world! Find out how to take the next steps in the boat below! Taking the plunge is the most intimidating part, but fortunately used boats tend to hold their value pretty well, so our first advice is to get your hands on a boat that you can start logging some hours in. Use the link below to check out classifieds at the National Class Association page. Pro Tip: We recommend buying a boat before committing to a teammate so that you can focus on skill development with a variety of partners before settling on the dream team. This also makes selling the boat easier when you're ready to upgrade or move on to your next adventure. Starting with a plan is critical in the skiff because the initial learning curve is so steep. We can help you find the nearest local training group to help get you started, and then it will be all about developing the foundational skills as quickly as possible. Skiff Squad Remote can help expedite this process by connecting you with our team of expert skiff coaches who will build a personalized training plan for your team by reviewing video of your sailing, updating a progress report, and interfacing with parents or local coaches. We support local programs all over Southern California by offering monthly Skiff Squad clinics with the top skiff coaches in the country. The events are open to teams of all levels of experience, so check out the master calendar using the link below, or find out what is going on in your region by using the "Regions" navigation option at the top of this page to select your region. To help understand where this crazy path could lead, and what goals you might want to set your sights on in the future, be sure to check out the "Goals" navigation option at the top of the screen. We have an extensive community of families within our team who are excited to help get new teams up and running, so let us know you’re interested and we can get you connected with a mentor to help show you the ropes. Please feel free to contact us any time using the contact info at the bottom of the page! If you post a photo be sure to tag @skiffsquad #29erintroclinic ! !